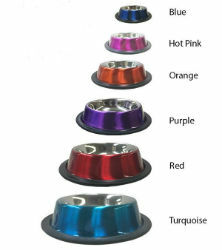 The same non-tip stainless steel bowls now come in Colors! Blue, Hot Pink, Purple, Orange, Red, and Turquoise. Made of rust and scratch resistant Stainless Steel with a rubber-edged base. The rubber-edged base is designed to prevent movement and spillage during feeding. Comes in sizes from 8 oz. to 96 oz. 8 oz. 16 oz. 24 oz. 32 oz. 64 oz. 96 oz.